We as parents know the struggle of feeding a small child. I mean let’s be honest, sometimes it’s a struggle to feed ourselves when it’s getting toward the end of the day and you just don’t have the energy, but you don’t want to order in again. There are days I don’t want to cook, but when you have kids, not cooking usually isn’t an option. Those are the days I look for a quick, but healthy solution. I always want to feed my little guy something that will give him nutrition and help avoid constipating him. The last thing we need is a constipated child, am I right? 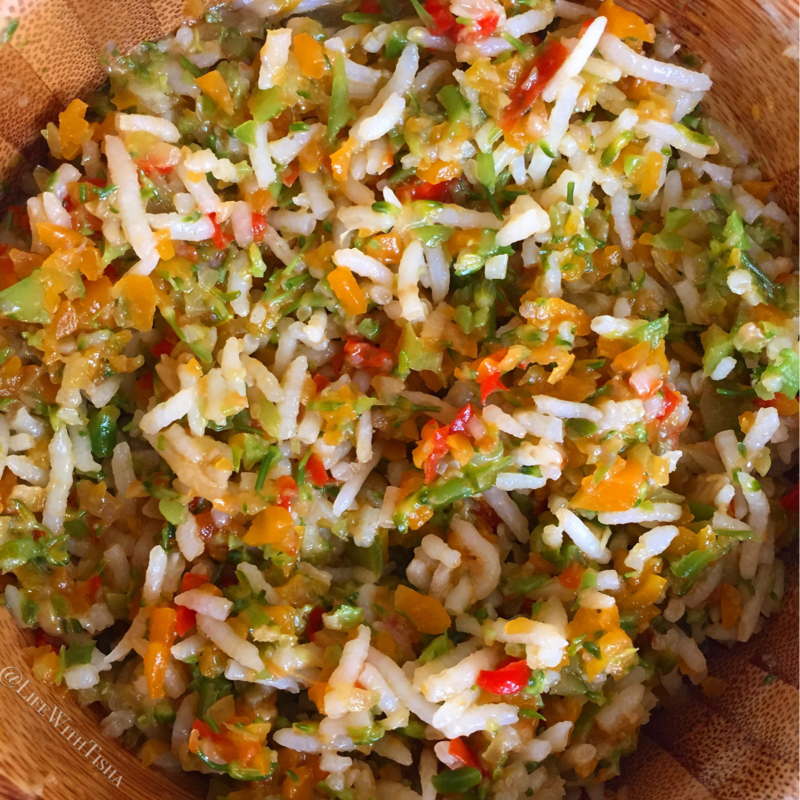 Rainbow rice is one of my favourite dishes to make Savya because it has rice, an assortment of veggies, and he eats it up in decent time. I won’t say “no time” because his average dinner spans anywhere from 30-60 minutes. 90 minutes if he wants to test my limits. 120 minutes if he wants me to die slowly inside. BUT I DIGRESS. My recipe has 5 different veggies. I also use oyster sauce, so this is neither vegan, nor vegetarian. However, I’m sure you can tweak it to what works best for you. You can use any vegetables you want, but this combination seems to work very well for us. Rinse and steam the rice so that it’s ready by the time you are done cooking. You can use long grain, short grain, or even brown. Whatever your family prefers is great! Wash and peel veg and cut into small pieces. Then throw into a processor to make into smaller pieces. It’s best to do this when it’s raw, to allow the veg to keep its shape. If processed after cooking, it will turn into soup. Take a teaspoon of vegetable oil (or less) and add the minced garlic for 15 seconds. Add minced veggies and stir. Add a tiny sprinkle of salt to help expedite the cooking process. Add a teaspoon of oyster sauce. Mix with the veggies to fully incorporate. Turn heat to very low and let the veggies simmer. Add a bit of unsalted butter (~2mm width) and mix. This is to help make a sort of gravy while adding more flavour to the dish. Cover and cook for about 5-10 minutes. Remove from heat, cool, and serve mixed with rice. Fair warning: Oyster sauce already has a lot of sodium, so be aware when you add it to your foods. Try this dish out in a way that you know will work best for your family. He usually eats this within 30 minutes, which is pretty fast for him. This dish is the fastest, easiest way to make dinner and feed my kiddo 5 vegetables in one siting. An absolute mom win in my book. Happy eats!